OpenBazaar is, among other things, a contracting platform that enables two or more parties to trade any thing. But if there is a common theme to the last few articles we have published, it is that the applications don’t stop at traditional e-commerce. One application of particular interest is the formation of speculative contracts that depend on the unknown future state of an object or event. Speculative contracts are a fundamental component of the market economy. They form the basis of insurance policies, loans, and futures markets just to name a few. Typically, enforcement of speculative contracts are handled through the courts or trusted third parties that have exclusive control of funds. 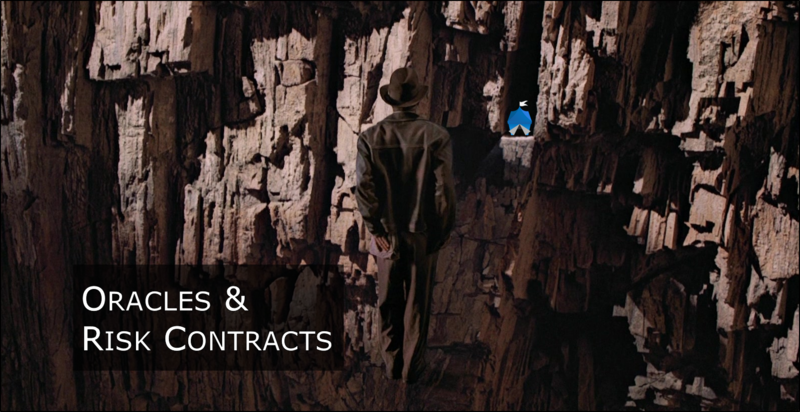 With Bitcoin and Ricardian contracts, speculative contracts can be resolved directly between two parties, or in cooperation with a mutually selected third party in the event of a dispute. To achieve this in OpenBazaar, we need to define a new user role on the network, an Oracle, who will report on the state of an object or event in the future. Secondly, we will need a Ricardian contract schema for various types of speculative contracts, which we will refer to as risk contracts. This article will review the role of Oracles in OpenBazaar and how risk contracts will be settled on the platform. Oracles are nodes on the OpenBazaar network that report on the state of any object or event in the future. Based on the Oracle’s report, a risk contract is settled in favor of the user who correctly predicted the future state. As a reporter, the Oracle can publicly report on the state of an object or event over time, which will serve as a data input for risk contracts between other users. These users may have little or no interaction with the Oracle directly, who can serve state reports in plain-text publicly or via OpenBazaar’s instant messaging service. Oracles may even report the state of an object or event using their own sophisticated APIs similar to Reality Keys. Critically, reporter Oracles do not handle any user funds and are not Moderators. Oracles can also serve as the escrow agent or Moderators, where the future state of the object or event, which they report on, is the basis of releasing funds from multisignature escrow to the appropriate party. Releasing funds would be done in cooperation with the winning party. This service may only be necessary if the losing party is a sore loser, refusing to release funds for immature reasons. Ideally, Oracles would only be required to release funds in the event of a dispute. 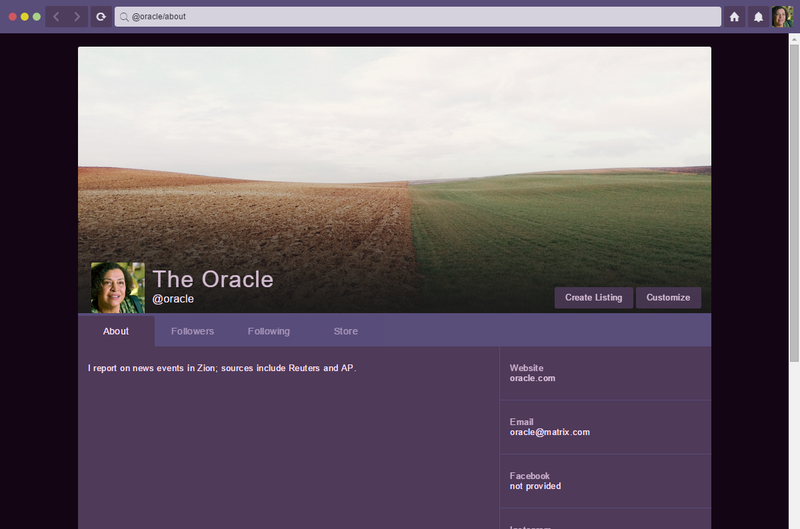 Just as with Moderators, an open market for Oracles introduces competitive forces and diversity to improve the quality and range of data sources. Oracles can advertise what categories of objects or events they will report on, and why they are uniquely qualified over their peers. The Oracle’s reputation system will reflect how accurately they report state and citing reputable sources. Any user can become an Oracle. For nearly all of these classes of risk contracts, an Oracle is required to validate the state of an object or event. In some contracts, the Moderator will act as the Oracle. All of the above objects are signed with the Vendor’s GUID to complete the listing contract that is published to the network. For each type of risk contract discussed below, we will examine the schema of the market object and briefly touch on the mechanics of the trade flow. For this type of contract, the Moderator acts as the Oracle, as the repayments are made to the Lender from the Buyer in bitcoin. The role of the Oracle in this scenario is to regulate the release of collateral (i.e. a reserve requirement) from the multisignature escrow address once the loan is repaid or the borrower has defaulted. In terms of discovery, the borrower may place an invitation to tender for a loan, where the above listing contract is a tender proposal. Creditors can submit their loan offers to the borrower, who sorts through the competing offers to select one with the best terms. This approach would give creditors a great deal of flexibility to tailor and compete on parameters such as the interest rate, reserve requirement, term, and repayment schedule based on the reputation of the borrower. Indeed, the creditor may require higher interest rates and collateral for pseudonymous users with a limited or poor reputation, relative to pseudonymous users with a high reputation or users with several public endpoints connected to their Blockchain ID. An alternate approach is for the creditor to offer standardized loans (i.e. bonds) on the network. Other users can purchase these bonds from the creditor, receiving interest repayments as per a normal bond. As this market matures, users will buy and sell bonds as a typical financial asset on the OpenBazaar network. Unlike physical or digital goods, or services, the trade flow is more straightforward after the loan is approved/bond purchased. Bitcoin repayments on principal and interest payments are made to addresses specified in the contract (stage 3 of the trade flow). The OpenBazaar application will keep track of repayments and manage dispute resolution through the Moderator as per normal. A fully collateralized insurance contract would lock the entire value of the policy (i.e. the maximum coverage limit) in multisignature escrow, while the policyholder pays regular premiums to the insurer. Theoretically, the accrued premiums plus collateral would be equal to the policy limit, but this may place the insurer at a financial disadvantage given that the policy funds are locked and are not yielding any interest. However, if there is no claim on the policy, the insurer will collect premiums that can be loosely considered a financial coupon that yields the insurer a reward for risking funds up-front for the policyholder. The pseudo coupon rate may be higher than low-yield government bonds, but significantly more risky. This may also turn insurance policies in OpenBazaar into tradeable financial instruments. Premiums for this type of insurance contract may be higher than standard policies, and may even exceed the policy limit. However, in exchange for the higher premiums, the policyholder is secure in the knowledge that if the policy is triggered, all of the funds are accessible. Unlike partially collateralized insurance contracts, there is zero chance of the insurer defaulting due to an inability to pay the policy limit, at the cost of the policyholder. This represents a significant technological advance in the insurance industry. A partially collateralized insurance contract only locks a percentage of the policy’s value in multisignature escrow throughout the life of the policy. As the full limit of the insurance policy is no longer locked in a multisignature escrow, the policyholder is now trusting the insurer to transfer the necessary amount of funds in the event of a claim. There is a risk of the insurer defaulting, which may be caused by financial mismanagement, higher than expected frequency/severity of claims, or simply fraud. A combination of regulation, reinsurance contracts, and transparent proof of reserves could potentially be used to mitigate the risk of the insurer defaulting. Partially collateralized insurance contracts characterizes the modern regulated insurance industry. This is only possible for traditional insurance companies because of the pooling of contracts, regulation, and access to reinsurance. A no limit insurance contracts technically fall under the ‘partially collateralized’ category. This contract doesn’t set a maximum coverage (i.e. the insurer is fully exposed to the total value of the item insured). Any amount of funds may be locked in multisignature escrow as collateral. If a claim is triggered, it may require the existing insurance contract to be replaced with a new insurance contract. Credit default swaps — an insurance risk contract can be taken out to hedge against the risk of a loan/bond defaulting. Some of these contracts may require interaction with legacy stakeholders (i.e. the government), which will be the subject of a future article. Forward and futures contracts allow two parties to speculate or hedge against the price of any asset. For example, a wheat farmer may take out a forward contract locking a sell order at a price of $100/bushel a year from now. This price would presumably guarantee the farmer to profit by an acceptable margin (provided at least X bushels are sold at that time), irrespective of whatever the actual market price is at the time. With the forward contract, the farmer sacrifices any profit that he might have gained had he risked selling at the market price a year later, if the market price had risen (e.g. $150/bush). Simultaneously, the forward contract protects the farmer from potential losses if the market price decreases a year from now (e.g. $50/bushel). Typically, neither party intend to physically purchase/sell the underlying asset. Rather, they novate to settle the contract. Pure price speculation/hedging is the common purpose of forward/futures contracts. Under the ‘spot_price_source’ object, either an API source or an Oracle ID can be added to establish consensus on the tie-breaking rules governing the settlement of the contract. While forward and futures contract speculate and hedge against the price of an asset, prediction markets speculate and hedge against the future state any object or event. For example, a prediction contract can be established between Alice and Bob based on whether it will rain the next day in Brisbane, Australia. Alice and Bob deposit 0.5 bitcoin into 2-of-3 multisignature escrow (Moderator as backup); the total value in escrow is 1 bitcoin. Alice goes long (i.e. predicts rain) while Bob goes short on rain tomorrow. The next day comes and it rains; 1 bitcoin is paid out to Alice from escrow. If Bob doesn’t live in Brisbane, he may check with the Oracle (or the Weather Channel) to confirm that it did indeed rain before releasing the funds. In this example, the chance of rain was 50%. But imagine that Alice and Bob both know that the chances of rain the next day, according to the Weather Channel, is 90%. Alice, predicting rain, deposits 0.9 bitcoin into multisignature escrow, while Bob deposits 0.1 bitcoin. As before, the winner is paid out 1 bitcoin from escrow. While ostensibly it seems that Alice is risking more than Bob, in reality her risk is lower than Bob based on the knowledge provided by the Weather Channel. In other words, the odds are overwhelmingly in Alice’s favor to collect Bob’s 0.1 bitcoin. Another way to see it is that Alice is paying a premium, in terms of risk, to entice Bob to risk his bitcoin on the outcome of an event that is unlikely to go in his favor. The OpenBazaar application will allow users to query the network for nodes that have identified themselves as Oracles, much in the same way that Moderators will be selected. Users will be able to sort through Oracles based on reputation, category (e.g. Oracles dedicated to reporting sports games, weather, news etc), or fees. Oracles can also describe on their store-front in detail what type of reporting they perform and the sources they rely on. She may bake you cookies. As stated earlier, an Oracle may act as either a reporting source or Moderator in a prediction contract. Discovery of prediction contracts is a key challenge to form an efficient prediction market. Prediction contracts can be formed between two users on an ad hoc basis, with the details negotiated directly between them. In this case, either party can create the listing contract. Alternatively, prediction contracts could be created by Oracles who commit to: 1) reporting on the state of a future event, and 2) acting as a Moderator for any prediction contracts that arise from that report. Oracles would create the contract as a Moderator, leaving open slots for a long and short position on the event. The price per share of each contract, which reflects the likelihood of the event occurring, can be dynamically updated by the Oracle in real time based on their ability to match users going long or short. OpenBazaar has a ‘follow’ feature to enable notifications, which means that a user can be notified from the Oracle when new events will be reported on or new prediction contracts become available. To minimize trust, prediction contracts can be coordinated by neutral Moderators who are not Oracles, who rather cite a user(s) or source as the Oracle. There are several projects attempting to create decentralized prediction markets, such as Augur and Truthcoin. Undoubtedly there are potential collaborative opportunities, particularly when it comes to resolving state in a decentralized manner. What is the key difference between what we hope to implement in OpenBazaar versus say Augur? The core difference is mostly philosophical: we believe that low friction markets for third party Oracles can create a supply of highly reputable state reporting, at near marginal cost and at scale, over time. While Augur is attempting to create the purest form of near-trustless state reporting (kudos to them! ), we believe that markets for third party Oracles can solve most of the challenges associated with creating a decentralized prediction market at a fraction of the technical difficulty. High value prediction contracts may benefit from the more sophisticated and lower trust-dependent approach taken by Augur. Implementation of risk contracts by OB1 developers is not expected until sometime next year. However, deployment may occur sooner with the help of volunteer and/or commercial contributors or partners. That said, the existing contract schema can be tailored to include the semantic data required for most risk contracts described in this article. Moderators can also include Oracle-based services in their store description. As a result, we may see some early experiments in risk contracts in lieu of an official implementation.